There is many options for powering your printer. 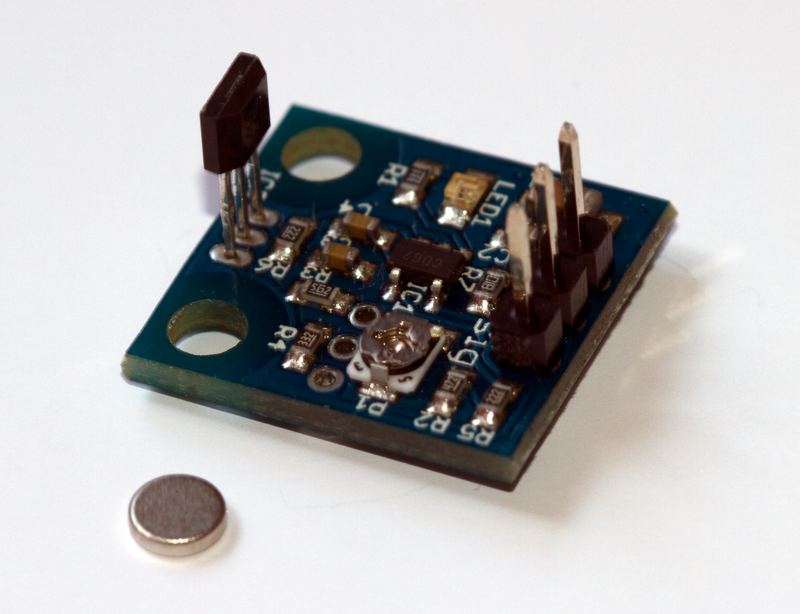 The easiest and most common is one single 12V PSU. We include some other alternatives as samples. However, you get better stepper motor performance and the heated bed reaches the given temperature faster if you use a 24V PSU. There is other alternatives like use separate PSU to power the heated bed.. When calculating how much power you need it is normal to divide the power in two. If your power is under powered you can get problems with unstable temperatures, skipping steps, overheating/damaged power.. NOTE: Be careful and check all your connections so you are certain that there is no errors in polarity (+/-) or shorted cables before you turn on the power. Errors can lead to damaged PSU or other electronics. 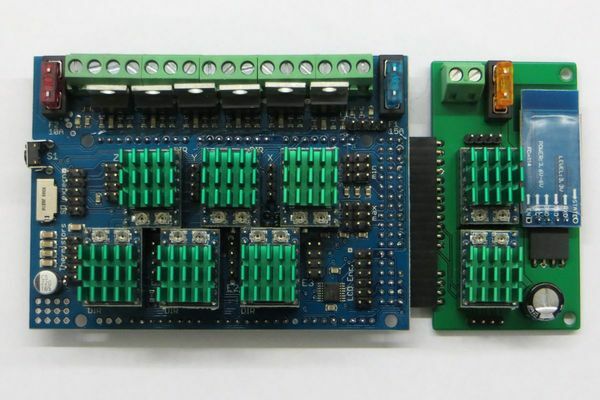 The standard for reprap is 12V. This is a good choice because this is suitable for heating purposes like an heated bed and an hotend. 12vdc is standard for most of components, and it is always standart for lot of other electrical stuffs, like fans, lightings… The biggest advantage about 12V usage is that you can easily find any power supply unit. ATX PSU are just fine for reprap printers, easy to implement, delivers a good quality 12V signal, availible with power range needed (easy to find more than 600W psu), and it’s not too expensive. Nevertheless, it could be sometimes useful to use 24V. First reason, according to me, is the poor quality of some heated bed who can’t reach target temperatures, In this case, you could most of the time make them working with a little more volts, it means, 24V power supply + PWM modulation in order to reduce voltage down to 14v/15V. It may boost a weak heated bed. Other reason, is if you often need high temperatures (lot of ABS, nylon), or you do not like to wait too much time for pre-heating. 24V Power supply with 24V components (bed, hotend), because power will actually be four times higher (twice V and twice A). If you use 12V 40W hotend, current will be 3,3A. With 24V 40W hotend, current will be only 1.7A. Therefore, you do not need to resize your wires, and it will be more power efficient, with a bit less electrical losses. There are much ways to supply power to RADDS according what you need. Standard 12V PSU setup. Used most of the time, should be reliable for most of the purposes. Everything is powered with the same 12v PSU. Initial choice with an ATX PSU. 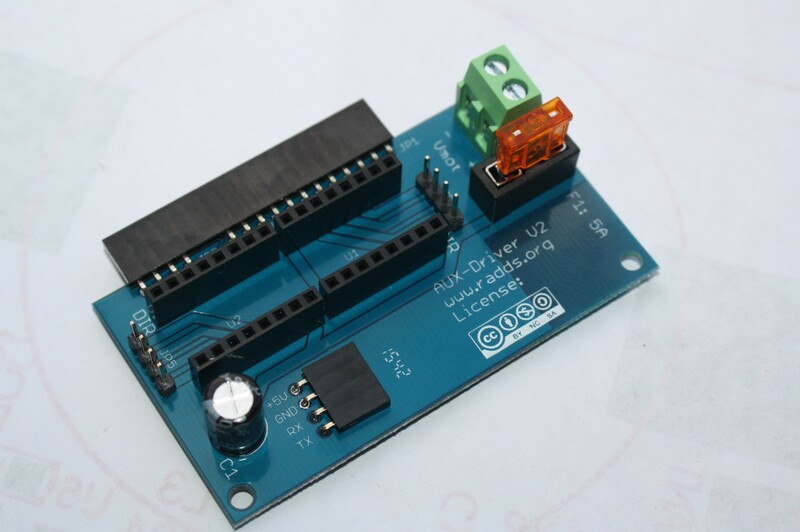 With this setup you use a 24V PSU to power the printer, instead of standard 12v. RADDS allows you to supply it with 10V-25V, so you can directly plug it on a 24V PSU. It will supply 24V to all your components (hotends, fans, etc…), so they must be 24V components, because standard 12V devices may receive severe damage, even could burn. According to your firmware, you could still use 12V components one some outputs, with a correct PWM setup in order to shut voltage down, see next chapter. This setup is the one you would use, if you need a powerful 24V heated bed, but each other component like hotend, fans, lights, etc… are standard 12V ones. 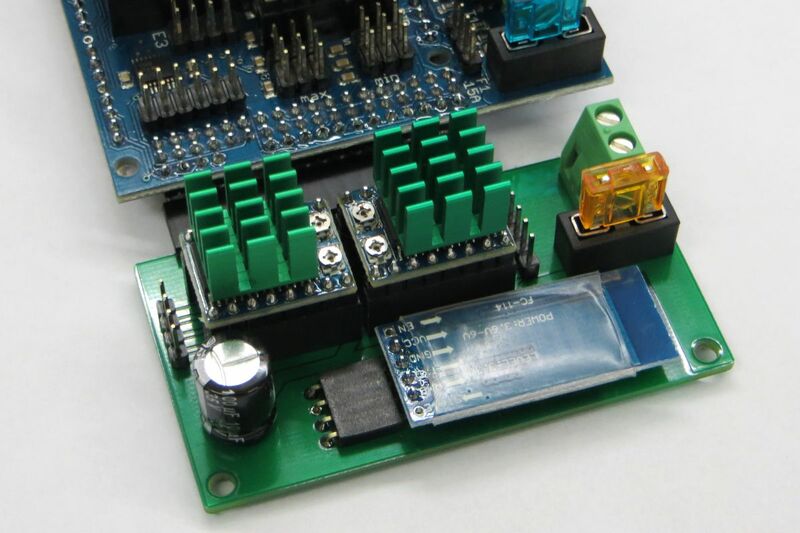 Software (firmware) will be used in order to reduce the power delivered to 12V components, thanks to the PWM modulation, which applies high frequency micro-cuts to the 24V signal, and gives the corresponding percentage of the voltage to the connected device. 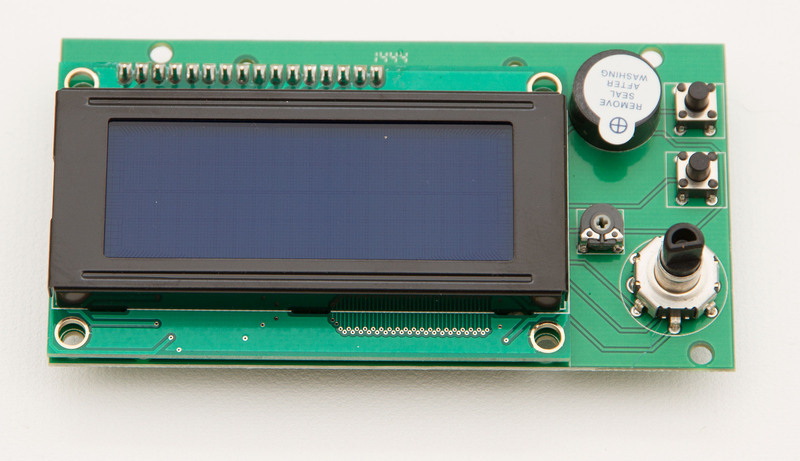 So that your 12V devices are powered with virtual 12V voltage. The duration of the Hi period, and the Lo period, enables to generate a virtual lower voltage. 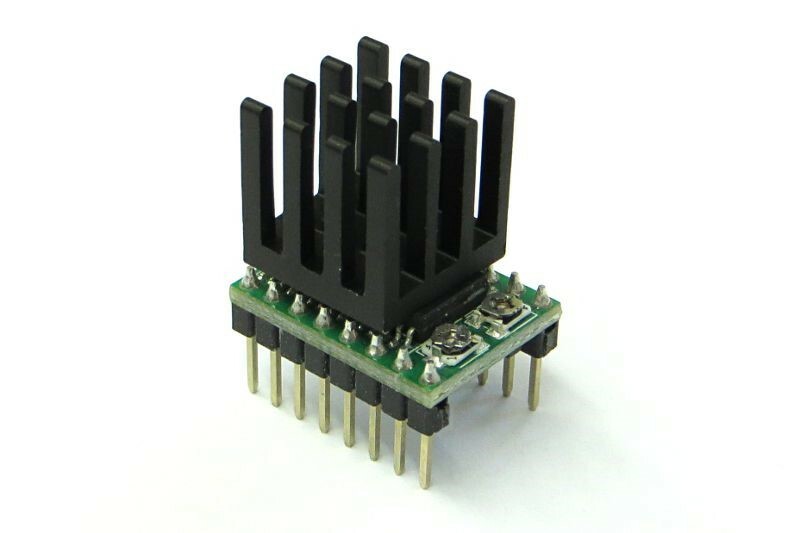 It’s very reliable, especially with DC motors, and more and more used in electronics. PWM is 8bits coded so 256 values are available. 0=0%time to max voltage = no voltage. 255=100% of time to full voltage = full voltage. 128 is the average, 50% time to 0V, and 50% time to 24V (24 for example). But it don’t means it will generate 12V, it not so easy. It’s always 24V but only a part of the time so that 12V devices could be supplied. 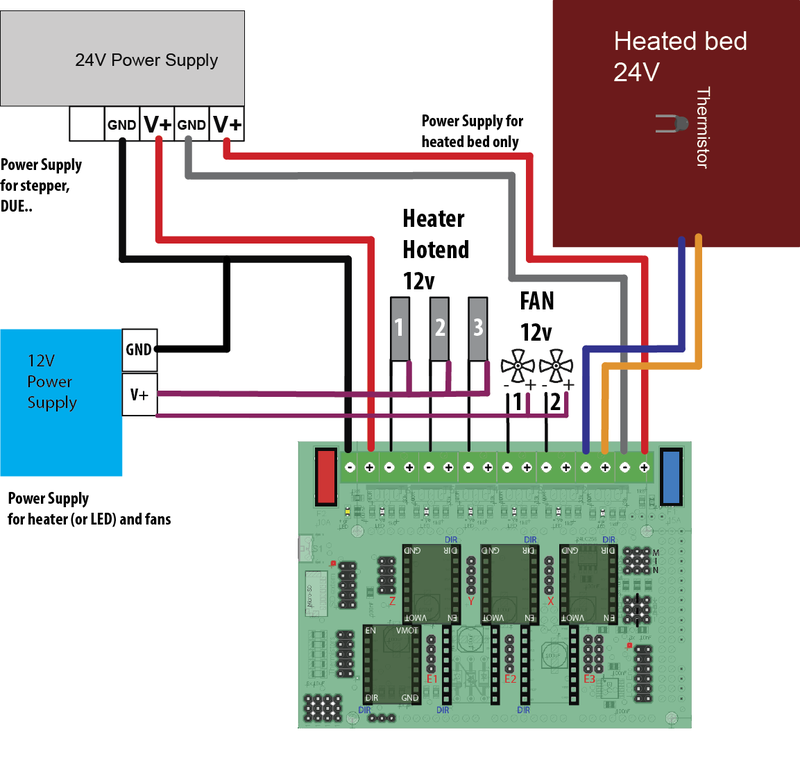 With 24V PSU, each output where a 12V device (heater, fans, lights…) is connected must be PWM-controlled in order to receive a “virtual” 12V voltage. This is achieved by altering some settings in the configuration.h file of your firmware. Values depends on the Hotend, so it’s difficult to give an always working figure. Usually, a good value is to divide original PWM value by 4. For example, a 12V PSU with a ‘255’ PWM setting would be reduced to ‘64’ when supplied with 24V PSU. Also depends of the individual Fan electronic setup. By most of them, it works, but we give no warranty for this. In this setup you combine a 24V (300-400W) PSU and a 12V (100W) PSU. 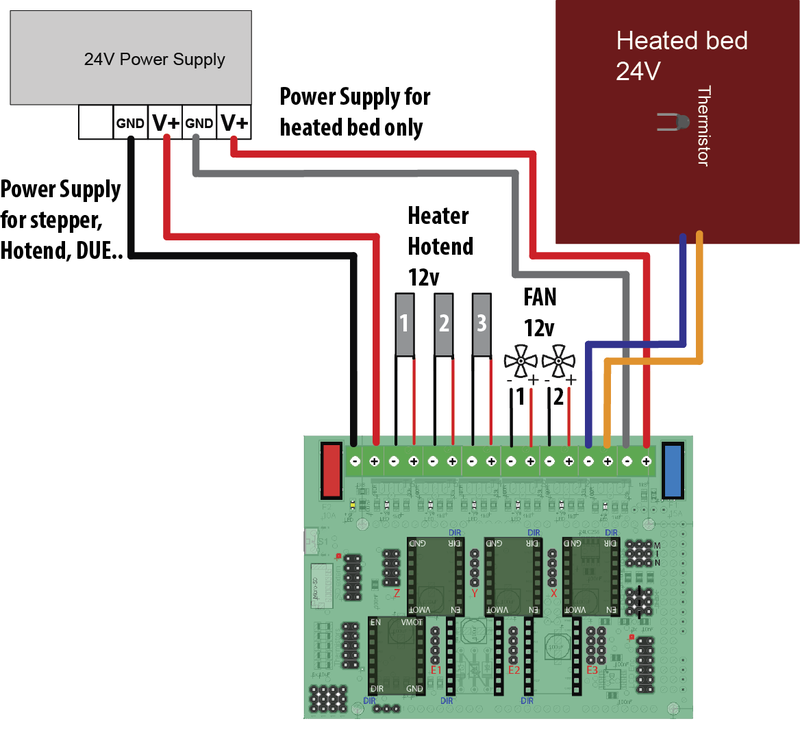 Sample: you power your RADDS, steppers and heated bed using 24V and fans, heater and case LED by 12V. RADDS do switch the negative side. Sample: To turn on Fan 1 RADDS switches the negative fan pin to GND. The positive fan wire is connected to +12V so the fan start. 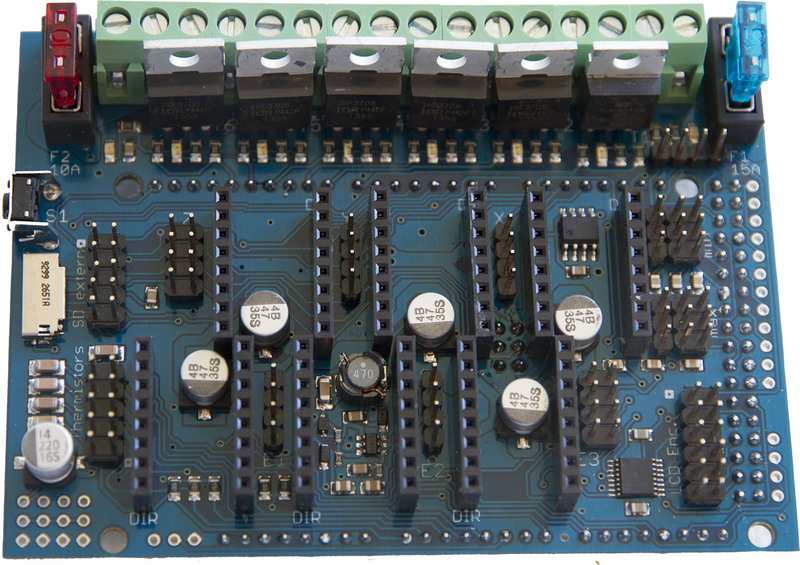 There are two power-inputs on RADDS, one for the Heated Bed, another for everything else. As seen in the wiring diagrams: each of these loops have the same electrical consumption (180W for both), so wirings will be the same size for each. We recommend using high quality copper wires (between the PSU and RADDS + between RADDS and the heated bed. Calculations done for 1meter wires, which is more than you usually need), loss 2%, and current that have to travel inside the wires.